Captain's Log, 30 June 2016. As I prepare to embark upon my first Football Manager journey for what is surely almost a decade I realise I must first submit to an overwhelming wave of optimism. I should perhaps be apprehensive, nervous, cautious of the digital unknown that awaits me. Much has changed since I last walked these roads. But I feel only excitement, eagerness to begin the long journey ahead. Giddy with thoughts of the memories I will make, the records I will break, and the hearts I will inevitably touch. That being said, there is only so much memory making, record breaking and heart touching a man can do when his footballing CV begins and ends with having (proudly) guided Chievo Verona to back-to-back sixth place finishes in Serie A on LMA Manager 2005, so, there is that to consider. To start I need tackle the first of what I anticipate being a litany of problems for me in my newly reignited managerial career and that is the small matter of choosing which club I am willing to lay down my life for. Now, for some, in a position similar to mine, opting to manage their own beloved club, the club they have grown up supporting, is the obvious choice. With what can sometimes feel like the whole world waiting for you to fail, why go anywhere other than home. Others may find themselves flattered by the plight of a plucky minnow, the allure of a perennial underdog, and set their sights firmly on taking a ragtag group of nobodies to heights altogether unknown to them. It certainly makes for a thrilling proposition, upsetting the status quo, tearing up the rule book and sticking it to the big boys. And if neither of those avenues seem appealing enough they may just delve a little deeper, examine the details a little closer, and handpick a club that most closely matches their personal philosophies in an effort to align their own off-field principles with those of their elected collaborators. What better way to handcraft an insoluble bond perfect for guiding a team to glory? For me, I tread a rather simpler route to my decided role. I choose Sheffield Wednesday, solely because I like their badge. As far as I can tell the little owl on their crest looks to have been drawn by a child and I think that’s bloody lovely. As good a reason as any to choose a football club, I’d say. Next comes the need to address my season’s aims. Having plumped for a Championship team I feel an appropriate target for the season ahead would be to aim for 100 points in the league. A tall ask, perhaps, given my inevitable ineptitude at the very game I’m aiming to master. But my research tells me that in the last ten years a total of 100 points has been reached three times, by Leicester City, Newcastle United and Reading, and none of those teams were lead by a manager nearly as undeservedly confident as myself, so I am happy to assign that as our official target. Of course, the nature of my ambitious aim implies that Sheffield Wednesday and I will be looking to win the league but technically that should be the ultimate aim of every team in every league so I have no issue with the media should they attempt to twist my words in such a way. This is one piece of prey I’m happy to let the vultures pick at. Upon arriving at Hillsborough, bright eyed and bushy tailed, I am immediately greeted by the club’s chairman, Dejphon Chansiri, who informs me of his wishes for the club stick to their philosophy of playing attacking football. “Hey, you and me both” I fire back at him. He winks at me, gives my right shoulder a gentle squeeze and swiftly departs, leaving behind nothing except the faint trace of his citrusy eau de parfum. I can tell we are going to be good mates. The first week at the helm flies by, my days filled with analysing my squad’s strengths and weaknesses, attempting to align my hopes for the season ahead with those of my new collaborators, and figuring out what the buttons do on pages I’m yet to explore. My busy schedule means our first pre-season friendly creeps up on me somewhat but my lack of preparation does nothing to deter my squad from thrashing AC Arles-Avignon 4-0 away from home. I feel the win was helped in large part by my picking of a full-strength team to play against a team in the seventh tier of French football. Rallied by our strong showing on the field, the successful acquisitions of experienced right back Paul Caddis and young centre back Danny Rowe, from Birmingham City and Wycombe Wanderers respectively, give me all the more reason to begin a new entry in my feelings journal which I title ‘the dream start’. 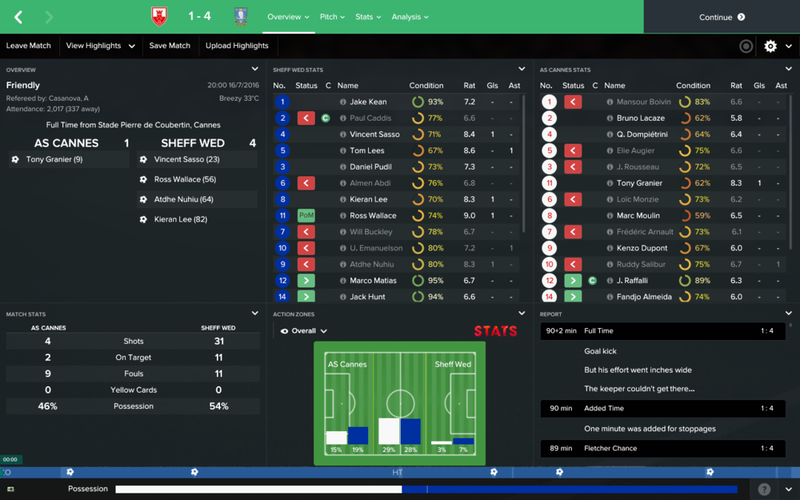 Given another boost by the 4-1 victory secured by a heavily rotated team away at AS Cannes, in my second game in charge, I feel myself really starting to settle in. I feel like I’m home, like Sheffield Wednesday and I were made for one another. Although it has only been a few weeks it just feels right. When you know you just know, you know? It’s like up to now I’ve been living but without ever truly feeling alive. It’s like nothing can stop me. Then something stops me. As my eyes move across an email regarding the future of my Under 23 squad's sports scientist Jack Green, my heart sinks. He has signed a contract with Sunderland and will be departing immediately. I didn’t know him personally. I didn’t even recognise the name. But it’s the principle. Life in Sheffield had started so well I’d almost entirely forgotten the cut-throat nature that exists within the world of football; a world where youth team sports scientists up and leave without a moment’s hesitation, where three weeks of workplace banter means nothing in comparison to money, job security and career progression. Suddenly I realise just how short-sighted I had been. All those hours wasted browsing brochures of squad-sized spa sessions, all the enquiries as to the availability of 35-man go-kart courses, all those contracts-for-life I’d drafted. All for nothing. If Judas - sorry, Jack - Green can leave so easily then what is stopping everybody else from following him out the door? The matter stays with me throughout the night, gnawing at me and I wake every few hours unable to sleep through the need to check my emails. But I can’t carry on this way. I have a season to prepare for. Thankfully I’m not left to suffer for long. 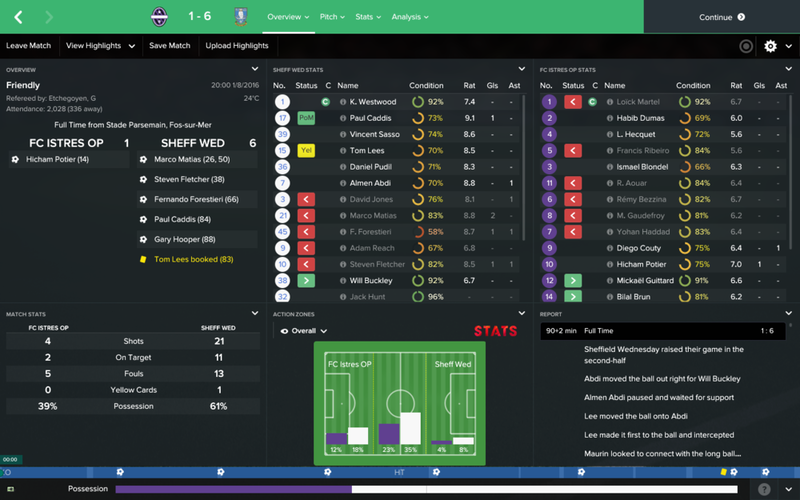 Our first pre-season friendly at home arrives on a sun-smattered morning in Sheffield, a clash against Le Havre, and I am desperate to give the home faithful a reason to be excited about the coming season at the earliest opportunity. Sadly the players take my instruction to focus on fitness and not worry too much the result a little too literally, as we succumb to a limp 2-0 defeat, but I choose not to dwell on the loss or the ethereal image of a cackling Jack Green that hangs over me like a guilty conscience and I move onto the preparations for our final pre-season friendly. In our last game of pre-season we travel back to France once more to face FC Istres OP and leave on a euphoric high having demolished them 6-1. Falling behind early on I feared we may have been about to end our pre-season preparations having lost whatever confidence we’d established with our two early wins. But in replying with six unanswered goals the squad emphatically proves the loss against Le Havre was only a blip and we forge onwards in high spirits. In the expert analysis of our pre-season form that I conduct on the flight home, the impressive 4-0, 4-1 and 6-1 wins away in France that bookended our drab 2-0 loss at home tells me in no uncertain terms that our need to relocate to France, for the betterment of our form, is far more urgent than I had ever considered. Still, with no option but to play all of our season’s competitive fixtures placed firmly on English soil I can only hope some of the skills evidenced against the French amateurs can be transferred into and across the many games we must play against our compatriots. With hope coursing through my veins much in the same way that blood would course through those belonging to a normal person, I look ahead to our first fixture of the league season with clear focus. Aston Villa, I hope you’re ready. By Will Sharp. Chapter 2 coming next Thursday, 16 Feb. Header image credit goes fully to John Lord.